* To get a spacing of 10mm with this spacer, your accessory must fit completely into the female T thread of this adapter. The length of the female T thread is 3.9mm. If your accessory has a male T thread longer than this, then it will not screw in fully and the extension provided will be greater than 10mm. 4.8 (Based on 40 Reviews) 93% of reviewers recommended this product. Excellent machining and perfect fit with the 2" T/T2 thread adapter for prime focus photography. Another great product from Agena! Ordered Friday afternoon. Had it Monday morning. Worked great for achieving the proper spacing between my focal reducer and CCD. I've used Blue Fireball spacers in the past - they're good quality and a good price. Threads are smooth and fit and finish are excellent. This one is no exception. Seems to be well made, but haven't used it yet. Arrived very quickly in the mail, thanks! This enabled me to achieve the correct backspace needed for my camera and FR/FF. The challenge with purchasing new equipment is that it will have threads of a size different from the older unit. Thankfully Agena a huge range adapters to solve the fitment issues that we run into. It’s a simple spacer ring. A little expensive. Nice machining, smooth threads. Good for the intended purpose. Excellent and works beautifully. One thing with these little spacers is to try not to overtighten. They tend to lock up. 5.0 Excellent product. Works as described. Excellent product. Works as described. Agena's Service is excellent. Needed this to set the distance of my guide camera on an OAG. Works perfectly. Review by Greg of Belpre, OH. Maybe not the fanciest out there but they work. 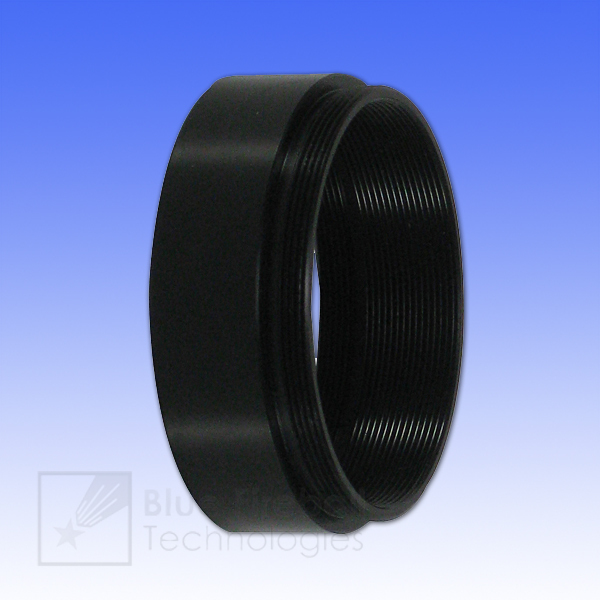 This adapter extends a T-ring threaded assembly by 30mm. It is well made and works exactly as you would expect. Review by Justin of Los Angeles. I purchased this to use with a 2" to T-thread adapter on my 4" f/5 short tube refractor. This combination allows my DSLR and autoguide camera to focus without having a diagonal in the light path. The anodizing is well done with now flaws, and the threading is smooth, with a perfect fit. Most importantly, Agena are the only supplier of such an item that I could easily find. I have quite a few Blue Fireball adapters and spacer and they are all of the same high quality. A lot of spacers are made from cheap aluminium with threads that strip and chip as soon as you use them. Blue Firebll are high quality with smooth threads. I needed a small amount of increased back focal length between a ccd camera frame and another adapter. This spacer did not work; not because of the spacing but because there was only 1 full thread on the male side of the spacer and that was not enough to engage the first thread on the camera body. There are only about 2 threads on the female side. In my case, both threaded ends could have had up to 6 full threads and still accomplished the 2mm spacing while adding strength to the connection. As it is, it cannot be used. Review by wboeck of Omaha. Review by dukeja of OK. It is my fault that I didn't check the female thread length so that my mating component cannot thread in completely, which makes the spacing not correct. Be careful on that! Review by Jose of Mexico. This product solved my reducer to chip distance problem. Review by JB of LINY. I used this spacer ring to gain additional lenght for a field flattner. It is well made with solid construction. Review by copperneck of utah. I puchased the 10mm ring to use as a spacer between Canon t ring and a GSO coma corrector. Works perfectly. These are simple enough. I needed some additional spacing to take up some backfocus between a focal reducer and my camera/filter wheel. Review by chuck of Julian, CA. Needed a spacer for a new CCD camera. Agena has a good selection. Worked perfectely. Review by njherr of Spokane, WA. Review by Rolf of Geyserland Observatory, Rotorua, NZ. It does what it was designed to do. It is inexpensive and lends itself to a number of combinations for astro imaging. I really can't see where it could be improved upon! Review by Brad of Phoenix. The threads are perfect on both ends. That is the important part. Review by Dan Crowson of O'Fallon, MO. Agena seems to be the best place to order these spacer rings. I used them to get the correct spacing for a field flattener. One thing to note - think about how to reach your correct spacing before ordering. I ordered a large one and a small one. The issue I ran into was that the smaller rings have very little thread on them due to their size. I would have been better off buying (for example) a 7mm and an 8mm to reach 15mm instead of say a 13mm and a 2mm. I made this mistake the first time and Agena allowed me to swap out for the correct setup easily without any kind of hassle. I always recommend Agena Astro at our local astronomy club. Review by Gary of New Zealand. I needed a thin T spacer ring to assist with the use of an Off Axis Guider. The 7.5mm I already had was too long, but the Blue Fireball in 3mm and also 4.5mm fitted the requirement perfectly. Cost effective as well. Very happy. Review by WhistleStop Observatory of Ontario, Canada. 5.0 Best spacers on the market! I tried a lot of spacers from others but none matched the accuracy and construction of the Blue Fireball...highly recommended. Two thumbs up for Agenaastro. Review by Chuck of Alpharetta, GA. I needed T-thread spacers to achieve the correct separation between a field flattner/focal reducer and my CCD camera. The product descriptions were accurate and I got exactly what I needed. Review by Marty of Santa Monica, CA. I bought the 40mm spacer ring as an extension tube for astro photography (eyepiece projection) use. It works beautifully, it is a well crafted piece and since it is all black inside, there are no unwanted reflections. Review by joel of Indiana. These spacers work well and are priced right, the least expensive I could find. Review by BDS of Calgary, Alberta, Canada. Excellent quality in machining, fit and finish. Would definitely recommend these products to everyone! Review by BP of Lexington, SC. I purchased this to gain proper spacing between the Baader MPCC and a CCD camera. The problem with this item is that although it is supposed to give 3mm spacing, such a narrow body does not allow the "male" threads of the MPCC to screw in all the way. Thus, in the end, the ring actually ends up extending the imaging distance by about 7mm. On the positive side, the finish of this piece is exceptional, the threads are smooth. I also purchased the 10mm and the 20mm versions, and am very pleased with them. So, the quality of this piece (and of all the Blue Fireball spacers that I bought) is great; just be aware that with the 3mm version, you will probably end up with more than 3mm of spacing unless what you are attaching has a very shallow male thread.